Prof. Patricia Marck, director of the School of Nursing, and Prof. of Nursing Research Kate Gerrish, University of Sheffield and Sheffield Teaching Hospitals. Professor of Nursing Research Kate Gerrish knows about teamwork. When it comes to developing collaborative approaches to patient care among health-care practitioners, she has influenced the development of national policy in the U.K. 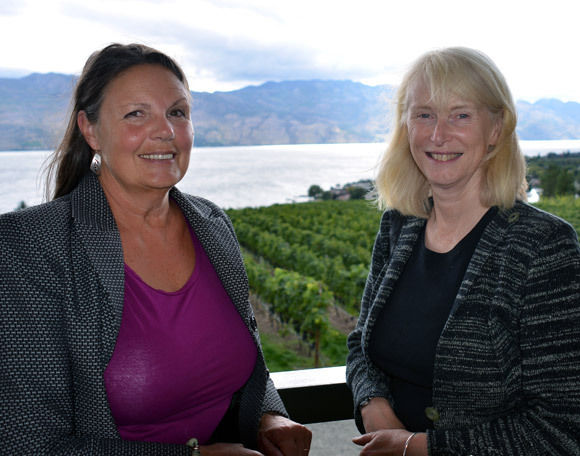 This week, Gerrish is a visiting scholar with UBC’s Okanagan campus School of Nursing. She has lectured on campus to nursing students and faculty and is sharing findings from her research with Interior Health practitioners and managers. Gerrish’s work is based on a practice model that sees researchers collaborate and work in partnership with decisions makers, such as care managers, policy makers and health-care practitioners. “This innovative approach to education and shared learning between students and staff supports our goal of providing high quality health care services,” says Heather Cook, Chief Nursing Officer with Interior Health. Gerrish holds a joint appointment between the University of Sheffield and the Sheffield Teaching Hospitals National Health Services Foundation Trust in Britain, leading and developing research to academic nursing staff and heading strategic development of research and practice for nurses. She is currently working on a 20-million-pound ($33 million Cdn) program of applied research in self-management of long-term conditions and a 2-million pound ($3 million Cdn) program that trials innovative strategies for knowledge translation. Patricia Marck, director of UBC’s School of Nursing, says making changes in health-care delivery presents numerous challenges due to economic, political and other considerations that impact health care. “The best way to drive change is to do it at the bedside with those providing care being supported by the right policies,” says Marck. Marck expects Gerrish’s research findings to benefit teams of practitioners and managers in building Interprofessional Clinical Learning Units in the Okanagan on an elder-friendly unit at Kelowna General Hospital and at the maternal child unit at Vernon Jubilee Hospital. “The whole idea of these units is to create a place where students, faculty, staff, and physicians all come to work and learn every day about how to provide better care and the learning environment is there for everybody,” says Marck. Interior Health expects to benefit from the enhanced learning partnership with UBC. “The development of clinical learning units, each focused on a different population, will be an exciting learning opportunity for staff at Kelowna General and Vernon Jubilee, and will provide us with quality strategies to apply more broadly across Interior Health in the future,” says Cook. Collaboration initiatives will help build capacity for coaching on the front lines of health care, says Marck. Students and practitioners benefit from being part of the process, she says.